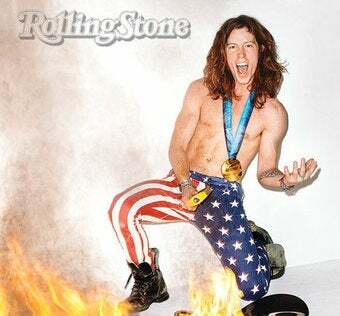 Hot off his gold medal snowboarding effort in Vancouver, Shaun White is like, feelin' it maaaaan. He's landed in snow, and now he's landing on the cover of Rolling Stone magazine. Here's Mr. White's Rolling Stone cover. He's wearing body builder pants and it appears that a snowboard is about to go up in flames. I am no genuis, but I think the implication is that Shaun White is like the certain master guitar player who liked to set his axe on fire during a performance of snowboarding. That's right. Rolling Stone is saying that Shaun White is the Buckethead of the exxxtreme sports. Interesting tidbit-Red Bull built him a ramp. Unlike me, he is not unnerved by Miley Cyrus' "Party in the USA." Also of note, fellow snowboarder and naughty boy Scotty Lago's Olympic Playlist appears to have been put together by a classic-rock dj. Scroll down to Scotty's list. I get the feeling he used his iTunes genius to put that list together. I hope you all had fun today and your apartment is now clean. Thanks for the tips, quips and nips (ok, no nips). And to the editors, a big hug for letting me fool around. Barry and David will be here on Sunday, so they can pick up the shattered pieces of Deadspin. Good luck. Here's the de-complicator if you need it.